Well, here’s the situation: My wife and I thought it was really cute to let our cat play in our roll-on suitcase: She pokes her head out and loves hiding in there. Fast-forward to two weeks later, and we smell a rank odor coming from the direction of the suitcase. I nervously smell it, and voilà, cat urine. How do we clean this suitcase? It’s so odd-shaped, and we can’t stick it in the wash. What do we do? Help!! I have ideas, I do, that I believe will work to remove the cat pee from your suitcase. But I also have some concerns, and I guess I’ll just go ahead and tell you what they are now, because otherwise I’ll spend the entire writing of this answer feeling nervous and upset. My concern is this: If the suitcase has a cardboard liner that helps to give it structure, the thing may be a goner, as cat-pee-soaked cardboard is pretty much unsalvageable. Now, you may not know what materials, precisely, the suitcase is made of, but I feel that the cardboard-lining thing is something I should mention at the onset before moving on to cleaning instructions, in the event that you do know precisely what the suitcase is made of, and want to save yourself time and effort. If you’re still with me, the good news is that cleaning the suitcase out should be fairly easy work. A bit of elbow grease is required, but really only a bit—set aside maybe 30 minutes for this operation. Not bad, right? I’m going to break the instructions down into three separate parts: The first one is what you’ll want to remember if you have a soiled suitcase that doesn’t involve a cat pee situation (such as, say, an exploding tube of suntan lotion, or bottle of illegally smuggled Italian olive oil). It’s also the step that requires the elbow grease, though I promise you won’t even need too much of that: You’re going to scrub the suitcase, inside and out. You’ll need a cleaning product, a small bowl or bucket, and a scrub brush. This style of scrub brush is one good option; a set like this is another, especially for suitcases that are oddly shaped or have tricky corners. An old toothbrush will also work. The idea, as you’ve probably gathered, is that you’ll dip the scrub brush in cleaning solution diluted with water in that small bowl or bucket, and chh-chh-chh the suitcase. Once you’ve given the luggage a really thorough scrubbing, dump out the cleaning solution, refill your bowl or bucket with water, and, using a clean rag or sponge, wipe the residue away, wringing the rag or sponge frequently, and replacing the water if necessary. But what cleaning product to use!?! Well, in the case of the cat pee, use something like Nature’s Miracle, which is an enzymatic pet-odor-removing product. There are others like it on the market, so if you can’t get Nature’s Miracle in your neck of the woods, look for any pet- or human-odor-neutralizing spray that’s enzymatic-based. If your suitcase mess is greasy or oily in nature, use a good grease-cutting dish soap like Dawn, or a product like Pine Sol or Lestoil (which are great on grease), or even a small amount of ammonia diluted in water. That should do you just fine. If the mess is of a powdery nature because your bronzer or Gold Bond or kilo of cocaine spilled, try to vacuum up or knock out as much as you can before wiping the interior out with a damp rag or sponge, and then scrub with dish soap or diluted laundry detergent to remove any residual staining. If you go the vacuum route, a hand vac or the use of a crevice tool is suggested. Dry the suitcase as well as you can using a clean towel, and then allow to air dry completely before packing or storing it. If it’s an option for you to do so, drying the suitcase in the sun is strongly recommended for two reasons. The first is that it will dry faster that way, and exposure to fresh air will further help in your deodorizing efforts. The second is that sunlight itself will act as an odor neutralizer, which is helpful to know for all sorts of reasons. Kitty litter will also absorb odors, which makes a lot of sense when you think about it, but probably isn’t the kind of thing you sit around thinking about. That’s fine! If you did sit around and think about stuff like that, you wouldn’t need me, and I very much enjoy being needed. 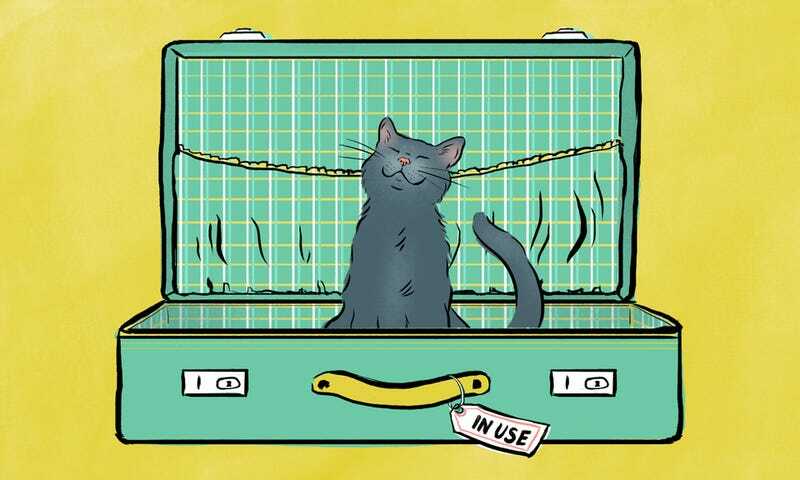 In the case of the cat-peed-upon suitcase, I still want its owners to give it a scrub, but if any odors linger after the fact, tossing a few cups of clean kitty litter inside the luggage, zipping it up, and allowing it to sit for 12-48 hours will go a long way in removing smells. The same is true of using straight up activated charcoal, or even baking soda. The litter method is also a really good one to remember in the event that anything overly perfumed leaks in your luggage, as even a really thorough scrubbing may leave behind a noticeable scent. Once the litter has done its work, dump it into the garbage or, I suppose, into your cat’s litter box (waste not, want not!) and wipe the interior free of any dust using a damp rag or sponge. Out of curiosity, I’d love to hear about the worst thing that’s ever exploded in your luggage. I’m sure there are spills/stains/smells that I haven’t considered in the writing of this, and, if that ends up being the case, I’ll do a follow-up post at some point on the insane things you all are packing, badly, in your luggage.